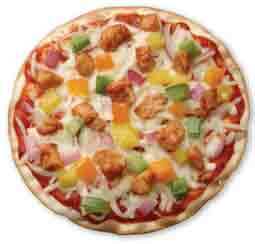 BBQ Chicken Pizza - A recipe from Savor California, the online showcase for extraordinary gourmet foods and beverages from California. Sprinkle cheese on top of pizza sauce. Mix chicken and BBQ sauce together then sprinkle over cheese. Add bell peppers and red onion.